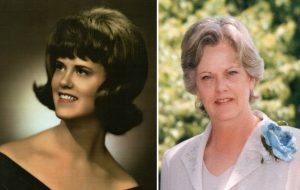 Phyllis Carol (Nugen) Hopkins was born at home in Marshall, Missouri on December 12, 1948 and departed this life on March 8, 2019 at her home in Pleasant Hill, Missouri, surrounded by the love of her family, at the age of 70 years, 2 months and 24 days. She was the daughter of Rodger Edwin and Dixie (Gordon) Nugen. Phyllis spent her younger years on the family farm. Farm life was hard, there was no running water or inside toilet and everyone bathed in a galvanized tub by the potbellied stove. There may have been few modern conveniences at first, but Phyllis was born into a loving and caring family, she and her sisters provided their own fun and entertainment, which may have included throwing rotten tomatoes at the neighbor’s garage. Phyllis was a 1966 graduate of Marshall, Missouri High School. After graduation, Phyllis moved to Kansas City and embarked on a career at Fitz’s where she worked on some of the earliest computers. On September 4, 1971, Phyllis was united in marriage with John William Hopkins, Jr. in Kansas City, Missouri. Phyllis and John lived in Kansas City until 1980 when they moved to Peculiar, Missouri to make their home. After her husband’s death Phyllis continued to live in Peculiar until 4 years ago when she moved to Pleasant Hill to be closer to her family. Phyllis was a passionate and remarkable artist who loved to paint. She also had a life-long love of music, especially Elvis Presley, and passed this love of Elvis music on to her grandson. Phyllis was a dedicated Royals baseball fan. Her love for family and life was larger than her demeanor. She was preceded in death by her husband, John William Hopkins, Jr., and her parents, Rodger and Dixie Nugen. Phyllis is lovingly survived by two daughters, Kimberly Franklin and husband Richard of Flowery Branch, Georgia, and Lisa Messinger and husband Ryan of Pleasant Hill, Missouri; two sisters Sharon Hagedorn and husband Danny of Camdenton, Missouri and Norma Kolwes and husband Bill of Missouri City, Texas; two grandchildren, Evan and Felicity; nieces, nephews, other relatives and many friends. She is also survived by her loving feline companion, Laverne. Cremation arrangements entrusted to Wallace Funeral Home. My deepest sympathies to the family. You are in my prayers.